Glorietta Bay Marina’s Dock C and the boat launch ramp are scheduled for improvements to replace the deteriorating wood infrastructure. SAN DIEGO — One day Glorietta Bay Marina’s Dock C will join Docks A and B in being modernized. Until then the bureaucratic process involving Coronado, Port of San Diego and other public agencies will continue to churn. Another step in the bureaucratic process was cleared on May 10, when the Port of San Diego Board of Port Commissioners unanimously approved Coronado’s conceptual plans for Dock C and boat launch ramp improvements. Commissioners also issued an appealable Coastal Development Permit. How improvements to Dock C and the boat launch ramp would look came into greater focus on May 10. The dock and boat launch ramp improvement project would cost about $3.3 million to complete, according to port staff. Plans call for the existing and deteriorating wood dock system to be replaced with concrete infrastructure. The proposed gangway would be compliant with the Americans with Disabilities Act. “A new concept design that elongates the dock and moves it away from the seawall creating better navigation between the pier head and bulkhead lines,” port staff stated. A dual use system would be created to allow the public dock extension to be used by small to medium size boats. A lower freeboard would also be included for kayaks, paddleboard users and rowing shells. Other proposed improvements are a 1,174-square-foot sand beach for watercraft launching, parking for off loading hand-carried watercraft, an expanded boat wash off area, reconfigured rip-rap to help preserve the shoreline, and exterior lighting for the boat ramp and gangway. Kevin Reilly of the Glorietta Bay Heritage Group told commissioners the renovated Dock C should not be allowed to extend into open bay. Reilly also questioned whether the dock improvements were consistent with the Port Master Plan, Coastal Act and Public Trust Doctrine. Wileen Manaois of the port’s real estate development department said improvements to Dock C are needed to bring marina infrastructure into full compliance with federal, state and local laws and to enhance recreational amenities. “The dock would be reconfigured to accommodate changes in vessel design, size ratios and design standards,” Manaois said. Manaois added the 34-slip Dock C is compliant with the Port Master Plan as it provides additional public access to the water and is consistent with the Coastal Act’s recreational policies. 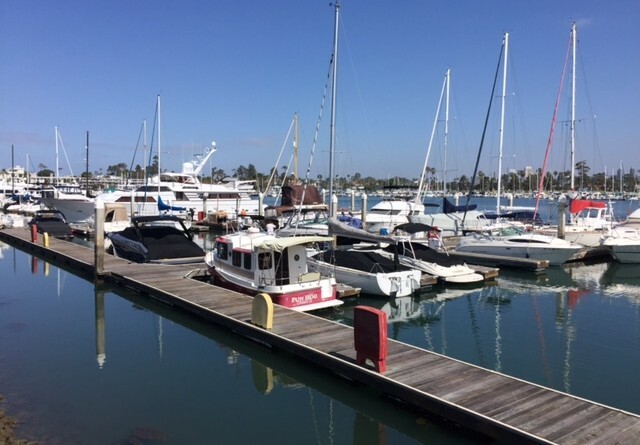 Coronado’s proposal specifically would increase Dock C’s water area by more than 6,000 square feet to accommodate the new dock design, update a use clause to allow for a boat launch ramp and dock, and update a prevailing wage clause. Commissioner Bob Nelson said his concerns with the proposed project were trumped by the overall benefit to the public’s use of Glorietta Bay Marina. Docks A and B each have 33 slips. Of the 34 slips at Dock C slightly more than half (18) would be used for vessels 30 feet or larger. A reconfigured Dock C would extend 84 feet beyond where its current leasehold boundary.